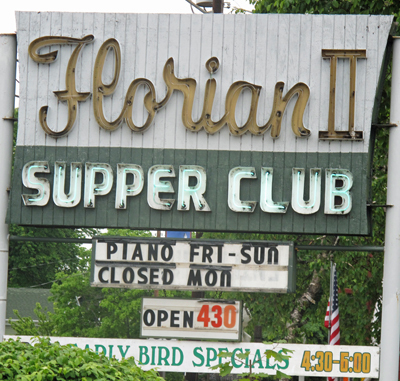 Right on Lake Michigan’s shore in Baileys Harbor you’ll find the Florian II Lakeshore Supper Club. Tell them DoorCountyNavigator.com sert you! Honestly, or reviewers have driven past this place many, many times – as it has been here for decades, but have not had the opportunity to dine there. Shame on us. We finally got our chance, and we have been back often. And for all these decades (over 5) the same family has owned and operated Florian II – so okay – you cannot thrive for over 50 years and not be good. And now I see how they have thrived so long – they ARE good! We walked in, past the zig-zag bar that can hold about 40 people, and got a nice table along the windows that overlook a lawn and the gleaming waters of Lake Michigan. Nice! Our waiter, Dillon, came over immediately and gave us menus and asked if we would like any drinks. Our party of two ordered some wine, and then perused the menu. Wow – you will find something on this menu that you will enjoy, from seafood to steaks and ribs. All the dinners come with an all-you-can-eat salad and bread. We ordered up an interesting dish, a rolled salmon – which was stuff with shrimp and roasted pepper; and a Lake Michigan perch. Since it’s a rib house, well, we had to test the ribs, so we ordered some as well! The whitefish is awesome. And they have awesome ribs. Dinners come with a salad of fresh crisp mixed greens, tomatoes, red onion, cucumbers, mushrooms and red cabbage, with a server of your choice between Door County Cherry Vinagrett, Russian or Ranch dressings. We tested both the Door County Cherry – light just tangy enough with hint of cherry, and the Russian, which was rich and flavorful. We ate a all of the salad. The rolled salmon was served with mixed vegetables and a baked potato (my choice). It looks appealing, and it tasted even better. A nice combination of flavors with salmon, shrimp and roasted peppers. I like it! 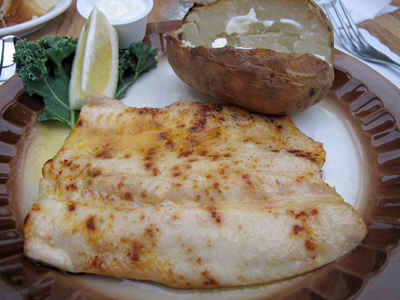 The Lake Michigan perch was lightly battered and fried. Now a lot of times, we have eaten perch like this and the battering was mushy, lumpy and not appealing in texture or taste. This battering looked good, and it tasted great! So we had to inquire. We now know why it tastes so good – they lightly fry the perch in veggie oil for starters, and, here is the secret – they bread the perch to order! Wow – we don’t know who else does this, but this extra touch makes all the difference. Kudos to the chef! The ribs were fall-off-the-bone dinner ribs, with a nice mild but tangy sauce (not too spicy, not too bland – just right). They have early bird specials from 4:30-6PM, which includes whitefish (awesome), ribs (yes! ), chicken breast over stuffing, or a steak. You get a salad and potato too with the early bird for $10.95. Terrific deal. The cheesecake topped with Door County cherries was delish. Check out their menu. CLOSED Mondays. Mark Hendee is on the piano for your lounge listening pleasure every Firday, Saturday and Sunday evenings from 5 -? in peak season! In short, our experiences were a delight. Simple, casual dining. Service was excellent (though it was not crowded at the time), food delicious, and view terrific (though it was overcast on some of the nights we dined). Nice selection of wines too, and full bar. We’re coming back! When we were finished, we introduced ourselves and talked with the owner/chef Jerry and told him how happy we were. So, take a walk on the quiet side, and head to Florian II for over 50 years of tradition, in the same family, and some very good eating! And please tell them that DoorCountyNavigator.com sent you! By doing so, you keep this site alive and well for you!